This past week, our Bound for Success kids got to learn how to make a couple of their favorite sweet treats from scratch. 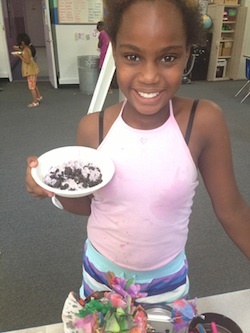 Not only does making ice cream and crispy treats give them a fun break from the typical shelter food, it teaches them valuable skills for following directions and measurement. The children got to individualize their ice cream with food coloring and toppings, making for some very colorful sundaes. Today we learned how to make ice cream with all the ingredients. We used vanilla, sea salt, ice, heavy cream, sugar, food coloring, sprinkles and Oreo’s. We all got to put in any color we wanted, and got to decorate it with sprinkles and Oreo’s how we wanted, too! We had so much fun because we were shaking, making and eating. Ms. Neffi helped us with it! – H.
Today is the best day of afterschool for me because today we made rice crispy balls and it was really fun. We needed marshmellow and butter. I tasted it before we made it into a ball and it was super good! – S.C.